It is with sorrow that the family of Captain Donald (Don) Henry Gunderson, Retired, USN, of Fillmore, California, announces he went to heaven on Sunday, October 21, 2018 at the age of 83. Don was born in Fargo, North Dakota to parents Palmer E. Gunderson and Hazel M. Gunderson (Anderson) on March 21, 1935 where he was raised alongside his younger brother Paul. After graduating from Fargo Central High School, he was awarded a Navy ROTC scholarship and attended the University of Wisconsin, Madison as a Midshipman, U.S. Naval Reserve. He graduated with a Bachelors of Business Administration Degree and was commissioned as an Ensign into the Unites States Navy in June 1957. He furthered his education, receiving a Master's of Science in Electrical Engineering from the Naval Post Graduate School in Monterey, California. Don met his first wife Joan Jane Francis while attending the University of Wisconsin. They married in the fall of 1957. His service in the United States Navy took him to numerous military ports and bases around the U.S. as well as abroad – including Norfolk, Virginia; Panama City, Florida; Pearl Harbor, Hawaii; the Mediterranean Sea and three assignments during the Vietnam War. 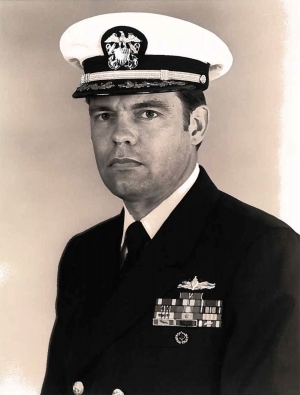 In 1976, Don was commissioned to the rank of Captain and assigned to Command at Sea, based out of Charleston, South Carolina as the Captain of the USS DAVIS (DD937). Under his command, the DAVIS was the Destroyer Squadron’s Flagship for its UNITAS XVII operation tour around South America. After commanding the USS DAVIS, Don was assigned to the Naval Surface Warfare Center, Port Hueneme Division, CA as Commanding Officer. His last active duty station was at the Pentagon, Washington D.C. In 1972, Don was awarded the Air Medal and Bronze Star Medal with combat “V”. He retired from the United States Navy on February 1, 1985 after his wife Joan, was diagnosed with breast cancer. They moved to Fillmore in March 1985 to be closer to their daughters, Jennifer (Gunderson) Pimentel and Vickie (Gunderson) Bogner. Sadly, Joan passed away in February 1986. Shortly thereafter, Don was introduced through his neighbors to Ruth Sanders of Fillmore. They were married in January 1987. In 1990 with two Fillmore Council members leaving the Council, Don took the opportunity to give something back to the community in which he now lived and loved, and ran for City Council. With Ruth’s support, Don won a seat on the Council and three terms thereafter. His twelve year tenure included two terms as the City’s Mayor. The 1994 Northridge earthquake was probably one of the most devastating and challenging times for the City. The City of Fillmore came through strong. Under Don’s leadership the City received immediate and long-term necessary FEMA monies and grants to assist in its re-building. In April 1993, Don and Ruth joined the Rotary Club of Fillmore. Don served as President, Secretary/Treasurer and Foundation Chair to name a few. In 2002, Don became a member of the Board of Directors of the Fillmore Piru Veterans Memorial District. He served with the veterans for many years and helped the Veterans Memorial District obtain several grants enabling the District to pay for a number of repairs and improvements. In March 2015, Don was recognized by the City of Fillmore and given its annual Lifetime Achievement Award. That same year Don and Ruth led the annual Fillmore May Festival Parade as the Grand Marshal. Together, Don and Ruth were very active members in the Faith Community Church of Fillmore. Don loved his travels with Ruth. They enjoyed 23 cruises that took them to many of the countries Don had been to during his long career in the United States Navy. These trips covered Europe and South America, including places like Machu Picchu, Peru and multiple Panama Canal crossings. Don is survived by his brother, Paul Gunderson of Rochester, Minnesota; daughters, Jennifer Pimentel of Fillmore; Vickie Bogner, and her husband Jim and their children James and Joshua of Carmel, Indiana; Scott Sanders and his wife JoAnn of Fillmore and Mindy Welch her husband Bill and their children Shelby and Koby of Ojai. Don’s Celebration of Life Service will be held on Saturday, November 17th, 2018 2:00 P.M. at Faith Community Church, 355 D Street, Fillmore, CA 93015. Reception to follow. Don's family is privileged to extend our deepest gratitude – to all of the people of Fillmore, members of the Fillmore Rotary, his Neighbors, members of the Faith Community Church of Fillmore, all of his Doctors, their Staffs, the Palms Assisted Living in Ventura, Community Memorial Hospital in Ventura, Coastal View Healthcare of Ventura and Dignity Memorial of Fillmore. There will never be enough ways to thank you for all you’ve done.